One of the most influential and controversial poets of his generation, Nicaraguan Ernesto Cardenal (b. 1925) is widely acknowledged as the greatest living poet of Latin America. Poet, priest, polemicist, liberation theologian, founder of the Solentiname primitivist art community, Nicaraguan Minister of Culture in the first Sandinista Government, 1979–87, Cardenal, in poetry which is both epic and lyrical, presents a vision of the social, political, historical and natural worlds of Latin America. 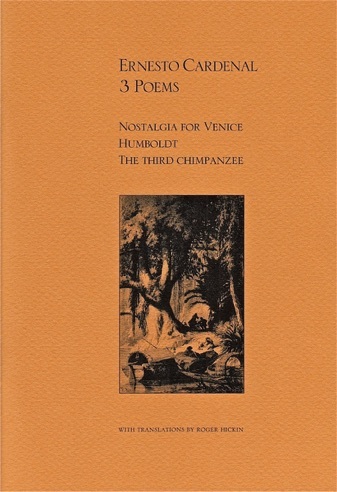 In the three recent and previously untranslated poems in this volume Cardenal writes about Venice, ageing and nostalgia; gives a vivid account of the elderly Alexander von Humboldt as he recalls his explorations in Venezuela and his encounters with Simón Bolívar and Thomas Jefferson; and considers the history of human evolution. Roger Hickin is a New Zealand poet, translator and visual artist.